For a DS game, that is a console limited by its portable capacity, it is beautiful. Still that “ligne clair” style for the game, and cartoon for the cinematographic scenes. I am not really fond of it. They wrote music in the right style, but… tiring. And the break for each enigma, and the sounds at each find, it is horrible. Simple and fluid. 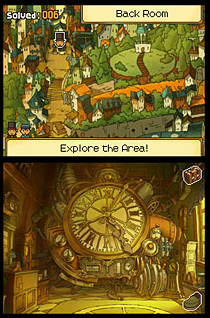 The manipulation that were one of the strength of the two first Layton were kept, there is still a possilibity to make a “draft” for enigmas. The moves should be done a bit more easily (like done either with the icon or with a button), but for the rest, everything is very well. With 168 enigmas and minigames and coins to discover, no length problem, even if the plot is fluid enough to go forward quickly. 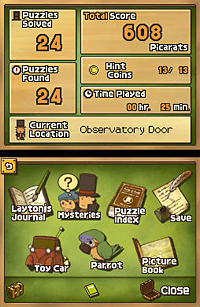 Oh, and the mini games are side quests, and 100 solved enigmas (I think) are enough to finish the game. 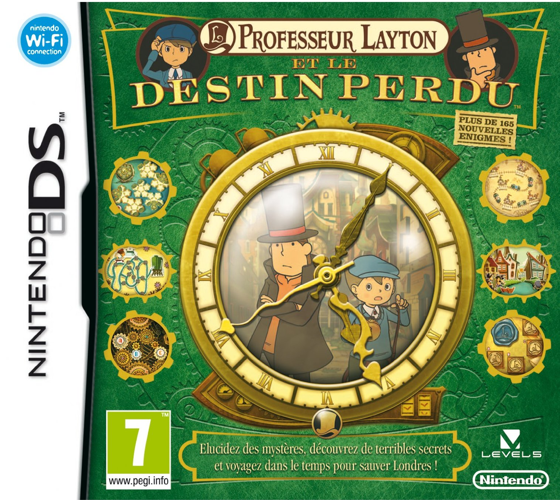 I must admit a weakness for Gentlemen, steampunk, time travel and detectives, so this game is right in my style. Add some paradoxes and humour, and it is really perfect. Again, a must buy. And if you have to choose one of the three, take this one.